With a new live-action Hellboy film set to be released next week, these animated stories were released at the perfect time . Face it… Fan-girls and boys, love Hellboy. And really, what's not to love? A red-skinned, snarky, Nazi-hating demon, which fights for and with, the good guys. Not to mention, a quasi, semi-secretive government agency that directs his actions to destroy paranormal and Lovecraftian threats to planet earth?! Think about it. IT has all the makings of an epic story so I ask the question again…What's not to love? Thanks to the vision of Hellboy creator Mike Mignola (if you have never read the comics, shame on you), we have been treated to a bunch of one-shots and mini-series, not to mention, a handful of movies, directed by Academy Award winning Director, Guillermo Del Toro, as well as some well-done animated features. Hellboy continues to intrigue and enchants so one more release is certainly welcomed. With this in mind, Lionsgate cleverly times the release of a double-shot of Hellboy goodness, with the animated 4K Ultra HD, Sword of Storms/Blood & Iron. Sword of Storms pulls our heroes into a plot surrounding an ancient Japanese cursed sword, which contains the trapped demonic spirits of destruction: Lightning and Thunder. If released from their prison, they will unleash total destruction on the Earth, in the form of their Draconic Brethren. Of course, this happens unleashing not only these spirits but two dragons as well and Hellboy and friends must figure out how to stop the evil spirits. The other story also ties the past to the present and pits the B.P.R.D against not only a powerful vampire, The Blood Countess, but her werewolf minions and the goddess Hecate, herself! Only Hellboy (Ron Perlman; Beauty and the Beast television series) and his partners, Liz Sherman (Selma Blair; Cruel Intentions) and Abe Sapien (Doug Jones; The Shape of Water) can thwart their evil plans. This is a nice set, presented on two discs, both Blu-ray, and 4K Ultra HD 2160p transfer in 1.78:1. The animation is simple, in style and, from what I read, had to be different from Mignola's own art style, which has been called by Alan Moore "(a mixture of) German expressionism meets Jack Kirby". While the art direction here doesn't lend itself perfectly to the upscaled, 4K transfer, it does look great nonetheless and honestly, I could hardly tell the difference between the Blu-ray and the 4k copies, with a few minor exceptions. The colors are at least rich and deep which enhances the viewer's experience. The Audio Dolby Atmos/Dolby TrueHD 7.1 sounds clear, though most of the channels seem to be underutilized. I didn't expect much in this department; however, there were moments when the action audio was engaging, as the fight between Liz and the Sea Dragon, or the brawl between Hellboy and Hecate. Overall, I had no real complaints, except maybe the score could've used more of a punch, and felt a tad underwhelming, at times. The combination of the two stories are a nice compliment to each other and putting them together in one combo pack was a terrific idea. With a new live-action Hellboy film set to be released next week, these animated stories were released at the perfect time and if you are a fan of the character I suggest you head to the store and pick up this 4K combo pack. 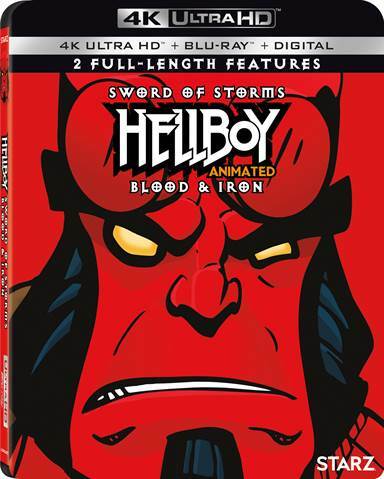 Download Hellboy Animated: Sword of Storms and Blood & Iron Double Feature from the iTunes Store in Digial HD. For more information about Hellboy: Sword of Storms visit the FlickDirect Movie Database.